Also, this month’s Hearing Life features a story about airport looping. Read the article at https://www.hearingloss.org/wp-content/uploads/HL_2019_2_Frazier.pdf. Juliette Sterkens, Au.D., and HLAA’s Hearing Loop Advocate recently wrote an article for Canadian Audiologist entitled, “Hearing Loop – The Preferred Large Area Assistive Listening System: Here’s Why”. One section is “Wireless Technologies – How They Work, Advantages and Disadvantages”. It is a full discussion of the three technology options for assistive listening devices in use in public venues, such as lecture halls, theatres, community centers, government facilities and houses of worship. Dr. Sterkens analyzes what sets these systems apart and their method of sound transmission. They are: (1) Radio Frequency (RF) or Frequency Modulation (FM) systems, (2) Infrared (IR) systems, and (3) Hearing Loop systems. A summary at the end entitled, “Hearing Loops Today Will Help Pave the Way for a Wireless Future” states: “When the time comes that a new universal worldwide assistive listening standard becomes available, public venues, already conditioned to focus on effective hearing aid compatible hearing access will not object to adding that new ‘5G’, or ‘Greentooth’ wireless transmitter, to help a new generation of hearing aid users hear while the hearing loop continues to serve the older devices still in use. Our Chapter’s Professional Partner members as well as other hearing loss professionals offer their assistance as they champion our mission to help others through information, education, advocacy, and support. The HLAA policy is to not recommend any specific product, ENT, audiologist or hearing aid dispenser. The Chapter follows this policy but has identified professionals who endorse our 501 (c) (3)’s mission to help others through information, education, advocacy and support. They are listed on our webpage at http://hlas.org/joanne-devries/. LISTEN! UP has featured ADA, FCC and DOJ rules and court cases on captioning from time to time. 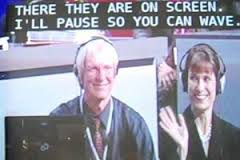 HLAA has prepared a short summary of situations where captioning is used. TV: Most TV programs and commercials have closed captioning which means written words of the text are displayed on the TV screen. The captions are accessed either directly by the TV’s remote or going into the menu and finding the caption options. The Television Decoder Circuitry Act of 1990 mandates that since July 1993, all televisions manufactured for sale in the U.S. must contain a built-in caption decoder if the picture tube is 13″ or larger. 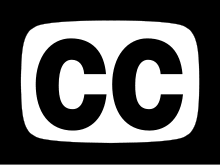 Closed captions on television programs most often have a black background and white text, although different combinations are possible. Movies: Movies on DVD are captioned as TV shows are. Captions are turned on by turning on the captioning through the menu. Movie Theater Captioning: Some movie theaters offer open-captioned movies (where the word appears on the screen for everyone to see) or offer closed captioning through devices the customer must ask for. To see where captioned movies are playing in your area, go to www.captionfish.com. Live Theater Captioning: Some theaters offer captioned performances of live shows. Captioned Telephones: Show written captions of everything the caller says. The written text appears in a built-in display screen. CART – Communication Access Real-Time Translation: The verbatim, near instantaneous conversion of spoken language into text. A stenotype machine, notebook computer and real-time software are used to produce the text. The text is usually displayed either on a screen by a projector connected to the notebook computer, or on a notebook computer or computer monitor. 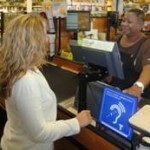 People with hearing loss who use spoken language as a primary mode of communication usually use CART. We have had presentations on travel rights at Chapter meetings and Anne Taylor has written about travel preparation for the hard of hearing in her column. HLAA has put together a summary of laws, practices and suggestions to ease your travel at airports. That summary is below with all the links. “HLAA is very much aware of the problems of not being able to hear well in the airport or on the plane and we have been working on this for years. There is no denying it has been a long slow process, but we are moving forward. HLAA sits on the Advisory Committee on Accessible Air Transportation (ACCESS Advisory Committee) that looks at disability issues. We know they receive training and have a complaint procedure if something goes wrong. Typically, at security the problems have not been with people with hearing loss – much more likely to be a problem with someone who uses a service dog or uses a wheelchair. But if you have specific incidents to report, we can help you file a complaint and can get that information to TSA. The airport is covered by the ADA, so stores and the airport itself are required to turn on the captioning on any televisions, and generally make themselves ADA compliant. So, some airports have installed an audio induction loop system, like the Gerald R. Ford International Airport, Grand Rapids, Michigan. An audio induction loop can be a big help, but will only happen after the local HLAA chapter or other groups of hard of hearing people spend their time advocating for that kind of access. In fact, the local people are in the best position to help the local transportation authority understand the impact of accessibility because they must work with local authorities and will be more likely to join meetings. HLAA can and does help local initiatives by providing input on educating the facility or providing advice in general. At the Gate, Airline Information Counter, Baggage or On the PlaneThese are all covered by the Air Carrier Access Act (ACAA). The airline is responsible to provide information to individuals with hearing loss, but they only need to do that once the passenger has alerted the staff to their hearing loss. We work with the US Department of Transportation (DOT) on these issues. Long ago, we send in comments and advocated for real time text displays of announcements at the gate, but this was not adopted by the DOT. Under the rule, people with hearing loss are entitled to get the information directly from airline staff, but only if they identify themselves as having a hearing loss. So, we suggest that individuals identify themselves as having a hearing loss when purchasing the ticket, again at the check in counter, again at the gate and once more on the plane. You are entitled to pre-board the plane as well. We also continue to push for visual speech to text both at the gate and in the airplane. It’s still slow going, but changes are happening. More and more airlines are allowing people to either bring their own tablet to receive their captioned entertainment, or passing out those tablets to people with hearing loss. Some airlines have started to provide the pre-recorded announcements as text on the seat back display. We hope at some point to solve the problem of speech to text for announcements on the airline, but that is a technical problem. Still, we will continue to work with DOT to increase the ability of the individual to get all the information they need every step of the way. HLAA Trustee Shari Eberts writes prolifically about the daily challenges of hearing loss. No situation is more difficult than trying to converse in a busy restaurant. She recently wrote this tip and with her permission, Listen!Up passes this on. “My favorite restaurant recently underwent a big renovation. The place definitely needed an update, but I was crushed. This restaurant was my safe haven from noise. It was old-school Italian. It had carpeting, acoustic tiles, fancy white tablecloths and waiters from Italy. The food was outstanding and the environment was perfect — quiet. Then they did the renovation. They removed the carpet and installed hardwood floors. They spiffed up the bar area, adding more hard surfaces, and swapped some of the cloth wall hangings for framed photos. I noticed the difference right away. The restaurant was now more visually appealing, but it was no longer quiet. Factor in my hearing loss, and this renovation has made dining out there quite challenging. My favorite-restaurant experience highlighted for me the problems that anyone with hearing loss faces these days as restaurant noise levels rise, tables are pushed closer and closer together, and trendy glass and hardwood replace sound-absorbing carpet and cushioning. As I looked for a new favorite, I started thinking about what makes a restaurant good for people with hearing loss and how we can advocate for ourselves to make sure we get an acoustically friendly table. 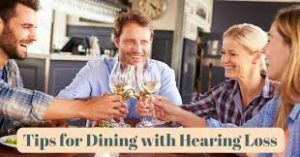 Here are my tips for a successful experience when dining out with hearing loss. Don’t wait to tell the restaurant about your needs. When you call to reserve and make a reservation online, note your desire for a quiet table. Then remind the restaurant if they call to confirm. This gives the staff a better chance of meeting your needs than if you walk in cold. Always mention that you have hearing loss – this often gets more attention than simply requesting a quiet location. If they seat you at a less than ideal table at first, ask for a quieter spot. Persistence can pay off. Request a table in the corner. A corner table or, failing that, a location beside a wall works best since there is a barrier between you and the noise of the restaurant. You also won’t have distracting noise behind you and will find it easier to focus on the speakers at the table. A booth is also a good choice if it has high back seats. Choose restaurants with sound absorbing decor. Carpet, curtains, cushioned chairs, cloth tablecloths and acoustic tiles are ideal. Most restaurants have websites with photos, so you can preview the decor before you go. Sit outside.If the weather allows, enjoy dining al fresco, where the noise from other diners has more space to dissipate. You’re also less likely to experience loud background music. Of course, this doesn’t apply if the outdoor seating is near loud traffic. Eat early or late.If you can avoid the crowds, the din from other diners will be lower. You’ll also be more likely to get the table that you want. And restaurants can be more willing to lower the music during off-peak hours. Read online reviews. Many restaurant rating systems now include noise level as one of the criteria. For example, Zagat has a “Good for Quiet Conversation” search category. Yelpallows you to search for restaurant reviews that contain the word quiet. Simply type “quiet restaurants” into the Find area on the main screen. You can also Google any restaurant’s name plus “noise levels” to unearth reviews that discuss how loud the restaurant is or isn’t. Shari Eberts is a hearing health advocate, writer, and avid Bikram yogi. 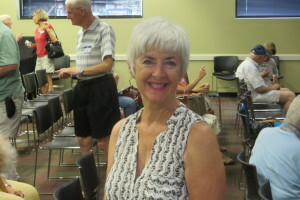 She blogs at LivingWithHearingLoss.com and serves on the board of trustees of both the Hearing Health Foundation and Hearing Loss Association of America. You can find Shari on Facebook and Twitter. HLAA has appeared at FCC hearings recommending changes in rules for cel phones to provide accessibility to the hard of hearing. HLAA reported on Monday the efforts have been successful. The Federal Communications Commission (FCC) released an Order to update its requirements for hearing aid compatibility and volume control on wireline and wireless telephones. An article in Hearing Tracker by Stu Nunnery is helpful in supporting members and friends in avoiding isolation, which is sometimes easier than dealing with your hearing loss. Mr. Nunnery is a writer, speaker, recording artist and hearing activist. He suggests joining a support group such as HLAA or others. There are a staggering number of people with hearing loss – close to one-in-six globally – and most of us are not getting the help we need. In fact, the National Academy of Sciences, Engineering and Medicine (NAS) reports that 67-85% of those with hearing loss still do not or will not wear a hearing aid. The reasons vary from person to person, with the most common being a lack of education on the signs of hearing loss, denial, social stigma, and the cost of hearing aids. Given the alarming statistics cited above, it’s clear that we are not doing enough to support (financially and otherwise) those who could benefit from hearing aids. The larger hearing loss community encompasses every population, age, and economic group. Most of us know someone with a hearing loss. It’s your boss, your customer, the person sitting next to you in church, the professor or student in a college classroom, the checkout clerk at your local supermarket. But because it carries with it a social stigma, many are in denial and reluctant to acknowledge or expose their hearing loss (by wearing a hearing aid), or even reach out for help. Those who do seek help may know something about otolaryngologists (ENT’s), audiologists and hearing rehabilitation specialists. But many of us find it insufficient to rely exclusively on the information and support provided by these professionals. Sometimes it takes direct communication with other hearing loss “sufferers” to help us to live with and move beyond our hearing loss. It took me many years to appreciate the importance of interacting with the hearing loss community. I spent more than three decades avoiding interaction with others like me. I never wanted to see myself as part of an outlier disability group or demographic. I was a “fully” functioning human being, I believed. I just couldn’t hear well. The hearing loss community focuses on hearing loss and I didn’t want to do that. I was upgrading my tech and trying to stay ahead of the curve so really, what more need I do? The irony, of course, was being a hearing health snob who thought he knew best while only further isolating me from the help I needed. It was clear what I should have done. I was alone much too often and for far too long and as the result much of my life was lived in a self-imposed hearing exile. The isolation I endured over that period of time had a tremendous cost. Yet in that regard, I was not unusual and isolation is one of the most challenging issues for all of us with hearing loss. New research suggests that untreated hearing loss and social isolation are both strong risk factors for dementia. So, where do we go to find people, places and things that might pull us out of our self-imposed isolation? The good news is that there are myriad hearing loss support groups across the country, many of them nearby, with interesting people, in and out of the box resources, social and educational activities, and emotional support that can fill in the gaps. And there will be gaps. Support groups are lifelines for the “hearing lost” that surprisingly are underutilized. Support groups have much to offer that you cannot get anywhere else. Most if not all states have their own agencies or commissions on deafness and the hard of hearing that provide leadership, advocacy and education and can lead you to multiple resources often just a phone call, text, or email away. You’ll find support groups in your state – sometimes multiple support groups – that hold regular meetings, conduct workshops, hold regional and national conventions, offer speakers, social events and activities as well as websites and Facebook Pages for easy connections and each with many more links with ever more information and resources. As I have, you will find a vibrant and diverse community, from all walks of life and circumstances, people with interesting lives and stories to tell. Many of them have spent large chunks of their own lives isolated and cut off as well. Our colleagues and peers in the hearing loss community have experiences and know things that even the professionals we work with cannot tell us. Collectively, we know the drills: how to hear and make adjustments when we’re challenged; how to survive in public places; how to talk about our lives and how to engage others regardless of our situations. We also know how to communicate in a variety of settings, with a variety of tools – not just with hearing aids and cochlear implants, but through lip reading, sign and body language, and especially with cutting edge assistive hearing devices and the latest tools, toys and apps. Most importantly, hearing loss support groups (see below) can help you to become your own best advocate, to take charge of your hearing experience, make the best use of technology, interpret the latest research, and identify the wide variety of services available that can build your confidence and enhance your communication skills. Isolation from hearing loss is not a fait accompli, it’s a choice that we make. Learning to live with and move beyond hearing loss involves too many steps and covers too much terrain to reside solely in the domain of the medical and technological professionals. The very personal, emotional, psychological and behavioral issues we encounter involve family, friends and relationships of every kind. They touch our interactions in the work world and the marketplace, the activities of our daily living from sun up to sun down. And they impact every aspect of how we manage and cope with a host of situations and circumstances that we ultimately find ourselves in. Within support groups, the chances are now greater than ever before to meet new people with similar and diverse backgrounds, skills and interests – to enjoy a conversation, go out to dinner, travel, see a show, or take a walk without feeling the need to explain ourselves. Above all, to laugh, love and enjoy life like everyone else. Email, texting and Twitter have been a godsend for us for sure, but nothing beats a real face, a voice and a soulful connection. Expand your universe of friends and colleagues in the hearing loss community. End your hearing loss isolation. Join a hearing loss support group. 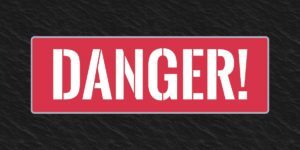 How Can I Keep My Family Safe When I Cannot Hear the Danger? She is an HLAA board member and has granted permission to use for ListenUp! “‘What is that noise’?” my son asked me one lazy afternoon this summer. ‘I don’t hear anything,’ I replied. ‘It sounds like someone is coming up our driveway. The motor is revving. Can’t you hear it?”’ he practically shouts in an increasingly worried voice. He was nervous that danger was approaching. I didn’t hear a thing. 6. Have an emergency plan: Discuss with your family where to go to stay safe in case of an emergency. This might be a particular part of the house (i.e., the basement for a big storm) or somewhere else in your area. All of us have been fortunate to experience an improvement in speech understanding and sound quality when a venue has installed a hearing loop. Wouldn’t it be ideal if all venues offered looping? Only through education and advocacy will public buildings, theaters, places of business and worship learn the value and importance of loop technology to the hearing loss community. Juliette Sterkens, Au.D is HLAA’s advocate for hearing loops. She recently published an article for The Hearing Journal in August to convince audiologists that hearing loops for public areas are superior to Bluetooth and FM due to the “telecoil’s easy and direct-to-hearing-aid-compatibility.” It is distressing that some audiologists do not educate their patients on the hearing loop. A portion of the article is reprinted below with approval from both Dr. Sterkens and The Hearing Journal. “HEARING LOOP BENEFITS — Dramatic benefits of hearing loops were documented in two studies. A survey in 2014 (Kochkin1) asked 866 people to rate the performance of their hearing aids or cochlear implants using a 10-point scale. The average response was 4.9 in a non-looped setting and 8.7 in a looped environment. A 2016 study by Faivre2 demonstrated hearing loops greatly improved speech understanding and sound quality, and reduced listening effort. How can a hearing loop deliver such dramatic improvements? Simple. In a hearing loop the microphone of the PA system is the microphone to the hearing aid. In a loop the distance and reverberation limitations of hearing aid microphones are overcome. Instead of acoustic transfer of sound, sound is transferred via the magnetic field. In a loop the user hears the cleanest and purest sound possible, often at signal-to-noise ratios that permit, even those with severe and profound hearing loss, to understand speech. And what about the budding child actor on stage? He may be heard ‘in the loop’, thanks to a telecoil, with greater clarity than the normal hearing audience can ‘out of the loop’. Small wonder that a hearing loop movement is spreading the USA, with new equipment vendors, dozens of trained installers, and now thousands of installed hearing loops in places small (all new New York City taxis), medium-sized (worship places and auditoriums), and huge (a handful of airports and Michigan State University’s basketball arena). This increased hearing aid functionality bodes well both for us hearing care providers and those we serve. Jill McFadden’s eyes widened in amazement as words that most BART riders take for granted beamed directly into her ears. The Pleasant Hill resident was trying out a new BART hearing service, which converts the audio into electromagnetic signals that can be picked up with compatible hearing aids or cochlear implants. 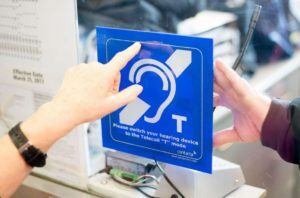 Per the American Public Transportation Association, BART appears to be the first public transit agency in the U.S. to install the technology, called a hearing-loop system, with the test in its Fremont Station. For riders like Moraga’s Anita Ogden, any step that helps her hear important public address announcements is a positive. About 17 percent of U.S. adults have some degree of hearing loss, and for people 75 or older, the figure climbs to 50 percent, per the National Institutes of Health. However, only about 20 percent of people with hearing loss use hearing aids. “The level of your hearing loss affects how well you function in society and a variety of situations,” Thomas said. Hearing-loop technology is available for people who wear hearing aids equipped with an internal antenna called a telecoil, or T-coil. Spoken words picked up by a microphone fed into a public-address system are linked to the loop, a thin wire that converts the audio into a magnetic signal that’s then picked up by the T-coil, which must be switched on by the wearer. “The hearing aid processes the audio and feeds it into the wearer’s ears. The hearing aid can reduce the background noise or other acoustic problems,” said Juliëtte Sterkens, a retired Wisconsin audiologist who is now a full-time national hearing-loop advocate for the Hearing Loss Association of America. “Hearing aids work best about 6 feet or less from the person talking,” per Sterkens. “When a large area like a church, museum or library is ‘looped’, the distance is greatly increased. They can hear the sound as if they are mere inches from the mouth of the speaker,” she said. BART officials said transit agencies in Europe and Australia use hearing loops. “The only other known transit stop in North America with a test hearing-loop system is in downtown Toronto,” said Virginia Miller, the American Public Transportation Association’s media-relations director. She thought about how other BART riders sifted through the normal station noise. “I don’t think it’s clear for people with normal hearing,” she said. Why are air carriers still failing people with disabilities? Lisa Goldstein, a writer for Backchannel, recently addressed our recurring airline issues. Many of our members that contact the disability department of the airlines find that due to simplified coding, a wheelchair awaits at the end of the trip. Why? At the end of this article, Lynn Rousseau, a Florida HLAA advocate and recent Chapter speaker is quoted. Here is the article – read it before your next trip in the “friendly skies”. “It’s 2017. Why are air carriers still failing people with disabilities? John Stanton, an attorney for the US Department of Justice, travels often for work. He’s deaf, which he notes in his profile whenever he buys a plane ticket. Last year, when traveling to San Francisco via United Airlines, Stanton disembarked from his flight to find an attendant waiting with a wheelchair. He looked up to see the aide was carrying his name on a sign. Stanton, who played football in college and has run seven marathons, was confused. “I told him, ‘Thanks, buddy, but I don’t need that,’” he recalls. Talk to a person who is deaf or hard of hearing, and you’ll hear a litany of travel horror stories. Take Laura Gold, who once found herself on the wrong airplane because the ticket counter didn’t tell her that her flight had changed gates. Or Carly Armour, who couldn’t hear the announcer calling her name and missed a flight that would reunite her with a long-lost brother. These kinds of mishaps aren’t limited to people who are deaf or hard of hearing, and they happen all the time. The millions of Americans with disabilities, who require accommodations when they travel, are dealt slipshod fixes when they travel by air. Often this happens because passengers are classified under the broad umbrella of “disabled,” as if someone who is paraplegic requires the same accommodations as someone who is deaf. But the system also fails because the technology it relies on is just plain outdated. “The Americans with Disabilities Act, which was passed by Congress in 1990 to ensure equal access for people with disabilities, only partially addresses air travel under its broad umbrella of mandates. That’s because the Air Carrier Access Act, an earlier bill passed in 1986, covers accessibility issues in airline travel. The ACAA is enforced by the Department of Transit, while the ADA is usually covered by the Department of Justice. The split responsibilities make the ACAA difficult to enforce. That means that airlines have less of an incentive than other companies and public agencies to alter their typical user experiences. So as terrible as airline travel is, if you have any kind of unusual need, it’s invariably worse. But these codes are often misused, per Eric Lipp, the executive director of the Open Doors Organization, a nonprofit that aims to improve travel and tourism accessibility. Airlines often just plug in the code MAAS, which stands for “Meet and Assist”, for passengers who are blind or deaf – which leads to the automatic wheelchair meet-and-greet. These codes are often the only information airport staff and other customer service representatives receive, because airlines withhold personal passenger information from contractors. Depending on the city and service provider, software often doesn’t recognize the SSR codes, Lipp says, or airlines use the wrong code, which gets misconstrued as it makes its way through the chain. That’s why Lipp, who travels with his own scooter, inevitably finds a wheelchair waiting when he deplanes. United Airlines — a company where many of my sources experienced problems while traveling — told me they use the SSR code HI for Hearing Impaired. But according to Lipp, all codes are four letters, and this code doesn’t exist. And changing a code isn’t easy, says Lipp, because the codes are used internationally. “Many underdeveloped countries would have to change their processes, which could be a financial burden to some,” he adds. It’s easier for service providers to join the software systems used by airlines, allowing for a continuous thread of information. And despite upgrades to airline comfort, in-flight entertainment still doesn’t include captions, aural action descriptions, or other ways of letting deaf and blind people participate. For the first time last fall, the US Department of Transportation drafted regulations related to captions for in-flight entertainment. The final agreement mandates that the same in-flight entertainment that’s available to all passengers also be accessible to passengers who are deaf, hard of hearing, blind, or visually impaired. Delta now provides captioning on in-flight entertainment on both seat-back displays and personal Wi-Fi devices, but only 20 percent of its airplanes have upgraded. Captioning is also available on JetBlue through its DIRECTV service on all Airbus A321 aircraft, and will eventually expand to the rest of its fleet. It’s difficult for anyone to hear airline announcements, but for people who are deaf or hard of hearing, it’s decidedly harder. Airlines are becoming more tech savvy, but Lipp says the industry is concentrating on mobile apps and devices. Mobile apps often include push alerts covering major announcements, such as gate changes or flight delays. Yet these alerts are often delayed compared to the immediacy of an announcement, and smaller announcements, such as an overbooked flight or a standby notification, aren’t included. Visual paging — when an audio page is posted in text form on screens — is becoming very easy, but it’s not yet ubiquitous. And what happens when a deaf person tries to complain? When I tried to contact Delta Airlines using the Relay, a calling system used by people who are deaf or hard of hearing, I received several hang-ups and long hold times. Corporate Care transferred me to the reservation desk; the reservation desk transferred me back to Corporate Care. There’s no email address for media relations or customer service. And Delta is supposedly one of the most accessible airlines. In 1986, because of the ACAA, airlines launched a system of complaints resolution officials – staff who are specially trained to handle disability-related issues for airlines. The CRO can handle all situations on behalf of the carrier, and all carriers have a central CRO at corporate. But that doesn’t solve all the problems. Lynn Rousseau, a member of the United Airlines Accessibility Board, agrees that the lack of accessibility at airports is frustrating. Travel has become accessible to so many more people, Rousseau tells me, but it still hasn’t adapted to meet the needs of every customer. Those customers are already advocating for themselves—they’re just waiting for the industry to catch up”. Last month, the Wall Street Journal had an article about TV sound. Chapter members are savvy about techniques and technology to help hear television but Geoffrey Fowler, the author, had some new ideas on how to make TV sound more clear. “You know there’s a problem when you keep reaching for the remote to crank the volume up and down. Or perhaps you’re like my septuagenarian parents, who squabbled recently about dad’s excessive cable news volume while mom was trying to read in the other room. The blame starts with TV makers, many of whom treat sound as an afterthought in their quest to make ever-thinner screens. You need at least a little junk in the TV trunk for speakers to produce decent sound. Nowadays, you’d be hard-pressed find a model with speakers even facing you—most TVs have speakers that point down or toward the back, where sound can get muffled. And volume levels can still be all over the map between your cable box, Blu-ray player, Apple TV and PlayStation. Short of cranking the volume up to 11, there are things you can do to hear dialogue better. Here are some proven strategies—plus new options for seniors and others who might experience moderate hearing loss. Before you spend a dime, try moving the TV. When I went to visit the engineers at Dolby, which makes audio and video tech, they helped me set up an experiment: Using a microphone and sound meter, we compared the speaker output of the same popular-model TV mounted on a wall and sitting on a table. The key is to measure the level of sound at around 1,000 hertz, where human voices tend to come through strongest. If you use a set-top box, you could also buy a $170 box called the AfterMaster Pro. Made by the company that mixes audio for the Fox show “Empire,” this small device plugs in between your cable box or Blu-ray player and the TV, and remasters the audio on the fly. AfterMaster is a little vague about what exactly it is doing, but when I tested it, movie dialogue sounded louder and a bit clearer, without diminished background effects. Living rooms got less messy with the arrival of the soundbar, a single piece of equipment that typically plugs into the TV’s audio-out (most often an optical audio, aka Toslink, port). These long speaker bricks generally do the job of the front set of home-theater speakers, including a center channel that’s key for dialogue. Soundbars have made great leaps in quality in recent years, and prices are falling. For $200, Yamaha’s AS-106 packs in a lot of sound. I use the $699 Sonos Playbar, which can be paired with other wireless speakers. Sonos recently introduced an app that tunes its speakers based on the room and couch placement. Some audio experts say that sort of calibration shouldn’t be necessary, but the process made my Sonos setup clearer. For seniors, the small, $250 Zvox AccuVoice AV200 is a basic soundbar that incorporates sound-processing tech like hearing aids. In my tests, the speaker made voices louder and clearer than my TV speakers alone. If your TV-listening volume makes the people around you uncomfortable, here’s a solution that may usher in domestic bliss: Hook up a pair of wireless headphones. Many new TVs are equipped with Bluetooth, so you can pair up any headphones you’d like. Some premium hearing aids can also double as wireless headphones, so check with your audiologist. Even better, when you use the audio-out for headphones, those around you can typically still watch using the TV’s speakers at a volume that works best for them”. Part of HLAA’s mission is advocacy. It could be as simple as reinforcing the importance of the loop. Last month a member verified the hearing loop was operable at the Venice Theater before purchasing tickets to “The Sunshine Boys”. Upon arrival, two signs were in the lobby. Alas, the dialogue could not be understood as the loop was not “on”. The member immediately went to the theatre office. They checked and advised that the system must have been jostled during an earlier event. The loop was turned on and all the comedy came in loud and clear. (2) the theater staff was reinforced about the value of loops to patrons with hearing loss. “The mission of HLAA is to open the world of communication to people with hearing loss through information, education, support and advocacy. HLAA achieves its mission by working diligently to achieve the following ten key long-term goals through our public policy and advocacy initiatives. In addition, we encourage the use of best practices by hearing health care professionals during the assessment and treatment of hearing loss. HLAA also supports vigorous enforcement of current local, state and national disability and human rights laws that include provisions for effective communication”. Policy makers and the public recognize that hearing is critical to healthy living and that hearing loss impacts all aspects of life. As such, hearing health care providers are knowledgeable about hearing loss and hearing health care is included in all aspects of health screening and health maintenance. Hearing aids, cochlear implants and aural rehabilitation are affordable and accessible, and covered by the Medicare, Affordable Care Act, and third-party payers. Affordable and accessible hearing health care along with appropriate consumer choice, education and transparency is provided to all who need it. Public and private venues, including all types of public transportation are communication accessible through technology such as hearing loops, FM, infrared, captioning and other technologies. All education and entertainment media (television, Internet video programming, and movies) meet the highest quality captioning and audio quality standards that ensure equal access, full understanding and enjoyment by consumers. Consumers have comprehensive choice and access to captioned and hearing-aid-compatible (HAC), high-fidelity, landline phones and mobile devices. Consumers are actively involved in the design and development of emerging hearing assistive technology. Hearing assistive technology (HAT) products are compatible and interoperable regardless of brands through open-source wireless technology. Emergency preparedness communication systems are accessible for people with hearing loss and first responders are knowledgeable about the needs of persons with hearing loss. Workplaces are communication accessible and welcoming to people with hearing loss. LISTEN!UP is reprising captioning and CART information to help newer members to advocate for themselves. Education and Advocacy are part of the HLAA mission. CART (Communication Access Realtime Translation) is verbatim text of spoken presentations provided for live events. Only the text is provided on a computer screen or projected for display on a larger screen. CART may be provided in the classroom, at meetings, workshops and other presentations including live theater – anywhere that someone with a hearing loss needs to hear in a group setting. The US Department of Justice (“DOJ”) considers captioning an accommodation under the Americans with Disabilities Act. Movie captioning is not yet a required accommodation in all cases, but DOJ is requiring closed-captioned movies for the larger movie chains. A final rule issued in November, 2016 states: “Movie theaters shall: (1) have and maintain the equipment necessary to provide closed movie captioning and audio description at a movie patron’s seat whenever showing a digital movie produced, distributed, or otherwise made available with these features; (2) provide notice to the public about the availability of these features; and (3) ensure that theater staff is available to assist patrons with the equipment before, during, and after the showing of a movie with these features”. Closed captioning is often critical to people who are hard of hearing or deaf. Television is the sole source of local information in an emergency for many. Both television and movie captioning is clearly a source of information, education and entertainment. You don’t have to have a hearing loss to find closed captioning useful: people for whom English is a second language use captions to get a better grasp of English, children’s reading is enhanced with the use of captions, and hearing people in bars, gyms, airports, and other noisy places appreciate the value of captioning. Captions on television are required with few exceptions. 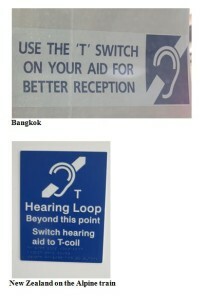 Hearing loops are truly international. Although hearing loops are prevalent in Europe, hearing loss advocates have made great strides down under and in other travelled areas in Asia. Katherine Bouton, an HLAA Trustee and author of “Shouting Won’t Help,” recently wrote an AARP column entitled “Frustrated by Silence at a Funeral”. She heard little of a friend’s memorial service because the church did not have a hearing loop or an FM or an assistive listening system. If a Church or a funeral home lacks such devices, all is not lost—CART can provide the realtime captioning necessary for your accommodation. Funeral homes are required by Title III of the Americans with Disabilities Act (ADA) to provide effective communication, including assistive listening systems—but please notify them ahead of time. Houses of worship are exempt from the ADA but may be willing to provide CART for a funeral if this is requested. Our HLAA Chapter is active with the Sarasota “Citizens with Disabilities Advisory Board” and made presentations to them calling for the looping of city meeting facilities. Sarasota City Council members were invited to our looped Chapter meetings (and attended) and were encouraged to accommodate those with hearing loss. Our Chapter’s CART professionals, Jack and Dee Boenau. 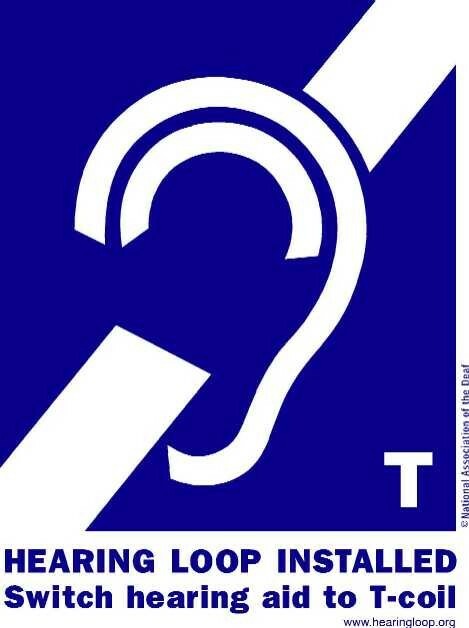 KNOW YOUR RIGHTS—there will be a presentation on the rights of hard of hearing persons at our February 10 Chapter meeting. Our advocacy was successful! The Sarasota City Hall Chambers and the Sarasota County Media Room located in the City Hall Annex Building are now equipped with an induction loop system that enables people with hearing loss to hear council meetings and proceedings more clearly. From our Chapter’s press release: “Approximately 145,000 residents in Sarasota/Manatee counties have some level of hearing loss making it a public health issue third in line after heart disease and arthritis. Over the past 5 years, our HLAA- Sarasota/Manatee Chapter has been successful in educating the community on the benefits of installing a hearing loop system in their business or venue. In addition to the Sarasota City Hall Chambers and the Media Room, more than 120 venues in Sarasota/Manatee counties offer hearing loop technology. The result is better communication access for persons with hearing loss benefit when attending area churches, the theater, or visiting business locations throughout our community”. Many of us have difficulty at airline counters, retail areas and fast food establishments—and many other public situations—due to the ambient noise and clerks not looking up. Give up on Starbucks, Subway, Publix deli, Quiznos and other coffee or sandwich shops? Some have. 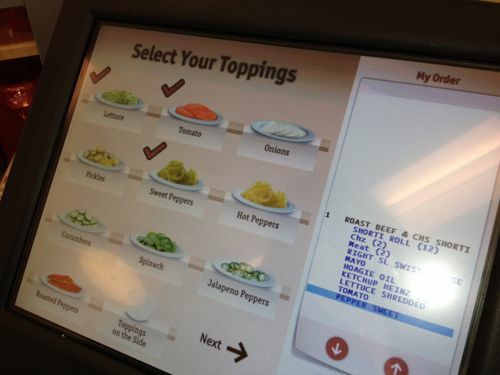 The new WAWA stores now offer touch screen ordering where every possible choice that goes into making a sandwich or a drink can easily be selected. Go through the choices and then pay and pick up the order—no need to play 20 questions and constant repeating. We hope to see more of this digital ordering to assist those with difficulty hearing in loud environments. Do your part in advocating at any store with loops or electronic ordering by simply letting the manager know and pick up a comment card and state your thanks for making shopping and buying easier. HLAA Convention veterans know Gael Hannan who has been the banquet speaker at HLAA Conventions and uses her comedy to make points about hearing loss and to encourage advocacy. She is Canada’s leading hearing loss advocate. Gael and her husband are completing a 10,000 mile trip around the U.S. and visited our Chapter meeting in April. If you are traveling this summer (or anytime), her April 15 article is a fun read but is instructive as what we can do when visiting attractions (Fort Sumter, Alamo, Mt. Rushmore, Hearst Castle and more in this article). 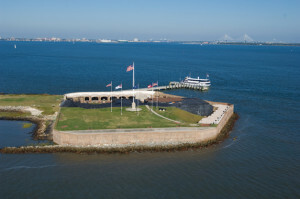 A quote to induce clicking ahead– “I fired another shot at Fort Sumter, this time on behalf of hearing accessibility. I don’t think any hell is breaking loose today, but I hope they are discussing it at this week’s Park Ranger’s staff meeting”. Gael Hannan is a writer, actor and public speaker who grew up with a progressive hearing loss that is now severe-to-profound. She is a director on the national board of the Canadian Hard of Hearing Association (CHHA) and an advocate, whose work includes speech reading instruction, hearing awareness, workshops for youth with hearing loss, and work on hearing access committees. Gael is a key developer and manager of The Hearing Foundation of Canada’s award-winning Sound Sense hearing awareness program for elementary students across Canada, and she also delivers corporate sensitivity training sessions on employee and clients with hearing loss. If you have hearing loss, you need hearing access. And if you want hearing access, you have to ask for it. Systems might be in place and waiting for you, such as print interpretation, captioning at the movies, bank counter loops to work with your telecoil, or other hearing aid and CI-compatible devices. But you may still have to ask for it. That’s the theory. But sometimes the systems that are supposed to be in place just aren’t. At Gettysburg, I used my hearing aid telecoils and a provided neckloop receiver. Print interpretation was everywhere. There was good signage at the Alamo, at the spot where Lewis and Clark ended their exploration, and where Wild Bill Hickok played his last hand of poker. That was all good. But this week, for the first time in a long time, I had an inaccessible tourist experience—at Fort Sumter National Monument in Charleston, South Carolina, the site of the Civil War’s first action. At 4:30 a.m. on April 12, 1861, confederate officer Lt. Henry S. Farley fired a shot at the Union-held Fort Sumter and then all hell broke loose. One hundred and fifty-four years and one day later, I fired another shot at Fort Sumter, this time on behalf of hearing accessibility. I don’t think any hell is breaking loose today, but I hope they are discussing it at this week’s Park Ranger’s staff meeting. On the half-hour boat trip to the island fort, an historian used the boat’s PA system to talk about Fort Sumter, its background, and the rules for touring (no playing on the cannons or writing your name on the bricks). Because of the boat noise and a large group of high school students on a field trip, it was difficult to hear him, so I tuned out, intending to catch up once we got there. Entering into the Fort, we were encouraged to gather around a National Park Ranger who talked for 15 minutes about the various battles and bombardments during the war. I’m sure it was very interesting but I can’t say for sure—he stood in shadow, used a PA system and had a moustache. No problem, I thought to myself, this is a government organization and there must be some sort of access. I asked another Park Ranger standing nearby what access she could provide. She looked a bit panicked, but took me over to a desk near the entrance, found the key to open it, and looked at the pamphlets inside. “Hmm, I know we have some copies of the speech. Oh here’s one.” She picked up a thick Braille booklet, but looked at me and we both shook our heads. “That’s a good idea, ma’am,” he said. “I’ll do that, ma’am, thanks for the advice.” And he seemed to mean it. OK, so it wasn’t a major shot or a decisive battle victory for people with hearing loss. More like a little pop. But hopefully the next person with hearing loss who pays good money and goes to a great deal of effort to get over to Fort Sumter, will be able to understand what’s being said. And that would be worth it, because history is fascinating. But, you have to ask. I didn’t train my new Park Ranger friends how to identify hard of hearing or deaf people. You’ll have to have to do that yourself. 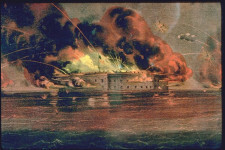 The featured image, ‘Bombardment of Fort Sumter’, is an 1861 painting by Currier & Ives. HLAA members and friends – Let’s Get Readyyyy to Advocate! 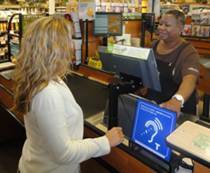 For the past year, Publix has installed loops at stores in Lakeland, The Villages and Sun City. The loops are placed at the pharmacy drop-off and pick-up, the customer service counter and the designated check out lanes. This was a test for response. WE RESPONDED! Our members and the local Chapter members in those locales have made it a point to stop at those stores and thank them and write a ‘thank you”. Our advocacy has been successful! Walgreen’s dropped a similar program in Scottsdale a number of years ago since no one thanked them or acknowledged the effort. “We are testing the system through the end of this year at stores 1270 (Lakeland), 732 (Sun City Center), and 1155 (The Villages). We have the hearing loop system installed on one checkout stand, one register at the customer service counter, and at the pharmacy drop off and pickup areas at each store. Jim Scott of Complete Hearing has been doing the Sarasota County installations and advises the installations should be completed by the first week of April. When the employees are trained and the loop system is fully operative, the Chapter will notify the membership by email and Facebook. The Chapter asks you to carry out our mission on advocacy and stop by the Venice and Longboat Key stores to thank them. Also, please but tell your hard of hearing friends to do the same. Next on the agenda, Starbucks! You can make a difference by doing the following! Send Publix Management a short email thanking them for placing loops in other stores and requesting a loop at your local Publix (name the store) at the beginning of the email. Support your request with why the loop makes a difference for you. 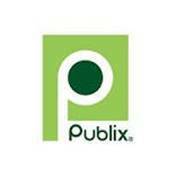 To send the e-mail go to: www.publix.com and go to “Contact Us” and submit your request in the comment column. You can also comment by phone at 1-800-242-1227. Tell the manager of your local store now about the loop test elsewhere and that you need a loop system, just like other Publix stores have put in. Give the store manager your email address and ask him or her to post you on any decisions or questions regarding the loop. If you get questions you need help on, please contact president@hlas.org. If you live near a looped store, check it out and thank the store manager for putting it in. It is important that stores with a loop realize their customers are using it as they will be the key reference for other retailers, banks, emergency rooms, theatre box offices and airport ticket counters which can gain great benefit from this counter top loop system.